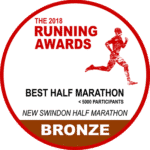 As many local runners will know, unfortunately, the previous format of the Swindon Half Marathon ran its last race in 2015. Swindon has a huge, and vibrant, running community, so we’re bringing back the race, but in a new format, which we feel is much more fitting to the runners of not just Swindon, but something that people will want to travel to the town for. Swindon is a large town with easy routes to the surrounding area, so deserves a race on a much bigger scale than what we’ve had over previous years.Starting and finishing in the town centre, the new course is largely very flat, and brings runners through the various highlights of the town including the Magic Roundabout, the County Ground, the Oasis, the Railways, the McArther Glenn Outlet Village as well as Old Town before a downhill finish into the Town Centre, where we’ll be finishing under the big screen of Wharf Green.With a split start finish, this will mean that rather than closing off the area for local residents and making it impossible for them to drive anywhere whilst the race is on, there’ll still be roads open for people to be able to go about their daily business, which we wouldn’t be able to do with a loop format.Runners will drop their bags off at the start, and we’ll have their bags ready for them at the finish, so there’s no worries about the logistics of getting back to the County Ground to collect their stuff.The town centre provides parking for several thousand cars, and the new car parks in Princess street or the rear of Debenhams provide a 0.4mile walk to the start, and just a 0.3mile walk from the finish.We look forward to welcoming you all to run with us on September 22nd 2019, and entries will open on November 1st online. It does not contain all allegra d 40 mg information about Ethionamide..